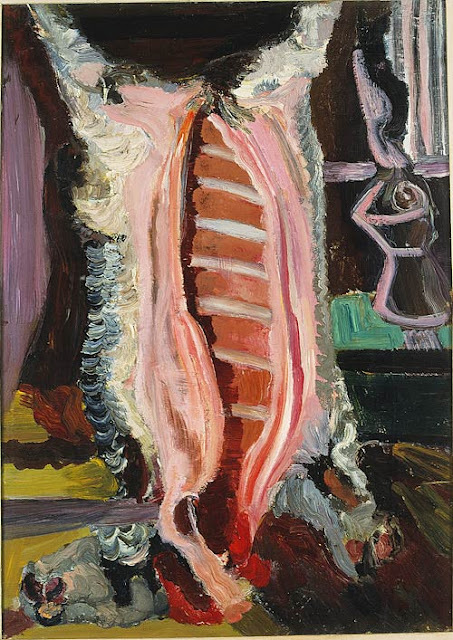 Bruno Cassinari: Butchered Calf, 1941, Oil on canvas, 87 x 63 cm, © Musei Civici Fiorentini – Raccolta Alberto Della Ragione. Cassinari's Butchered Calf is one of the featured works that comes from the Alberto Della Ragione Collection, currently on show at the Estorick, London N1. Della Ragione collected and patronised Italian Modernist art contemporaneously. Initially for him, as the show brochure accedes, this style of painting was alien and challenging, an almost incomprehensible artistic vocabulary. In time he turned his attention to a group of burgeoning young artists assuring first refusal of their new work, with the promise of a monthly stipend. The Butchered Calf, with its soft pink hues and the almost restful repose of the calf's head is more decorative than bloody or violent. The animal is still part of the carcass; the veal that will later grace the table is laid bare. Butchery here is given a positive platform - a connection which unfortunately in the most part is now lost on those who buy their meat in a industrially processed homogenous form or the anorexic environment of the supermarket meat counter. By reconnecting with the source of our meat our concern for the practices of animal husbandry and as a consequence animal welfare would become a natural consumer choice as opposed to a casual afterthought.